Are you passionate about parties? Do you live to cook? Now you can realize your dream of working from home at something you enjoy - a home-based catering business. Author Denise Vivaldo shares her experiences and advice on every aspect of setting up and running a thriving home-based catering business. Are you passionate about parties? Do you live to cook? Now you can realize your dream of working from home at something you enjoy - a home-based catering business. Author Denise Vivaldo shares her experiences and advice on every aspect of setting up and running a thriving home-based catering business, from estimating your start-up costs and finding clients to outfitting your kitchen and staying profitable. The Author offers tips on the latest high-tech help, including CD-ROM recipe books, culinary Web sites, and computer software designed especially for chefs and caterers. Learn all about defining your market niche, selling yourself as a pro, establishing your daily schedule, pricing your services, organizing parties with ease, honing your food presentation skills, avoiding the ten most common home-based mistakes and much more. Reader Ryan Fisher from Santa Maria, California says, "Denise Vivaldo has done the food service industry a service of her own in writing this book. As a caterer, I couldn't put it down, I read the entire book in one sitting. 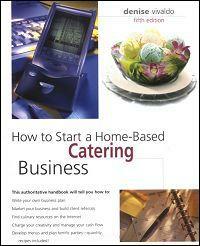 If you are considering a catering, or even a restaurant business read this book! I found Vivaldo's insight to be not only helpful, but it pointed out areas of the field I had scarcely considered." Do you have what it takes to be a Caterer? Reader T. R. Richardson from Delaware says, "This was the first book my sister and I bought to research home catering and WE HIT THE JACKPOT! This resource is especially helpful because it has a conversational tone and reminds newbies to catering of some important points: you will learn as you go and always keep the profitabililty of the business in mind in all decisionmaking. The author literally reminds readers to 'not act like you can't understand the math' and run the business properly from day one. My level of enthusiasm to begin this endeavor is much increased after reading this resrouces which is encouraging and has since become our 'little black book.' Highly recommended as a staple next to whatever other resources you choose."